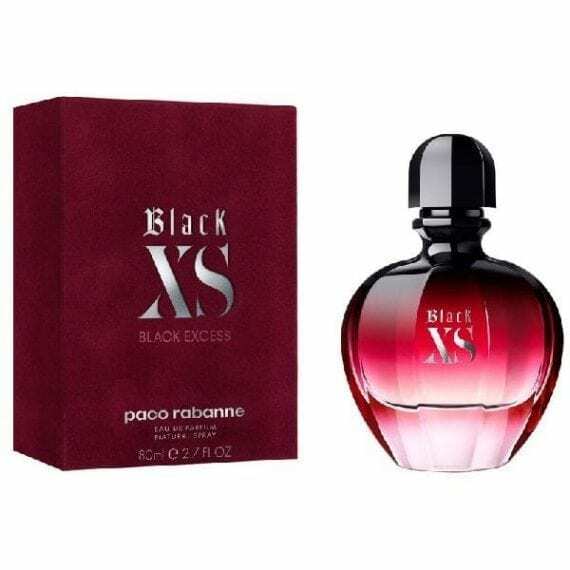 Paco Rabanne Black XS (Excess) for Her Eau de Parfum. Newly repackaged in 2018 but the same mysterious, feminine and sensual perfume originally launched in 2007. This is a rock ‘n’ roll fragrance for a stunning rebel princess consisting of top notes of pink pepper berries and cranberry; heart notes of black violet, cocoa flower and the base of patchouli and black vanilla making this an ultra-feminine floral & fruity perfume. We would class this as a moderate to long lasting scent with the most predominant notes being the cranberry and cocoa. Great longevity with this Eau de Parfum and available to buy in 3 sizes – 30ml, 50ml & 80ml.